"I'll wait for you, however long it takes. I'll wait for you forever." The "sweeping romance-adventure epic" is a genre Hollywood rarely visits these days. The stunning visuals and melodramatic love story set amongst some sort of conflict has been surprisingly absent from theaters in recent years. Legends of The Fall is one of the few entries in this group and it is surprisingly one of the best. It is essentially a romance novel translated to the screen, but the good performances and amazing cinematography make this film stand out. Fed up with the treatment of the Indians, Col. Ludlow (Hopkins) moves his family to the wilds of Montana. He has three sons: Alfred (Quinn), the oldest and most mature; Tristan (Pitt), the middle child with a love of nature, and Samuel (Thomas), the youngest and most idealistic. When Samuel brings his fiancée Susannah (Ormond) home, she begins to fall in love with at least one his brothers. Legends Of The Fall is unabashedly romantic and strangely, the films works for the better because of it. It isn't a far stretch to call this a Giant for the 90s, as it has often been labeled. The similarities between the Rock Hudson/James Dean classic and this film are multiple all the way up to the straight-laced suitor and his rebellious rival. Legends isn't just a "chick flick", either—it has something for everyone. For women, there is an ample amount of romantic moments and forguys there are deaths, shootings, and even the action of a war scene. As director Edward Zwick's follow up to Glory, the film doesn't represent a great step forward for the acclaimed director. His 1996 film Courage Under Fire showed better skill, but with Legends of The Fall his effort is uninspired. He handles the story with little tension between the leads and the battle scenes are done without any sense of adventure. Perhaps his largest mistake is that this sweeping epic was filmed in 1.85:1 as opposed to the seemingly logical choice of using a wider aspect ratio. The cinematography by John Toll is nothing short of amazing. Toll received several much deserved awards for his work, and it ranks among the best work done by this gifted DOP. The cast is uniformly excellent, with standout performances by Hopkins, Pitt and Ormond. Hopkins steals nearly every scene he is in without over-acting, even when the part seemed to call for it. Ormond, whose performance in this film had everyone thinking that she was going to be a huge star, plays Susannah well and holds her own against these Hollywood heavyweights. Pitt's Tristan carries the film and he does a great job. He proves here that he is a gifted actor and is getting better, as last year's Fight Club showed. Aidan Quinn and E.T. 's Henry Thomas round out the cast with equally good performances. Image Transfer Review: This is the same transfer that was used for the previous movie-only disc and the 1.85:1 anamorphic image is close to stunning. Colors are vibrant and the black levels, which show up quite often, are done very well. Sharpness is good although this film does have a bit of a soft look to it. The only flaws in the transfer are a few print problems that show up periodically. Pixelation also becomes an issue halfway through the film, but it could be my own player. Overall, this is another fine transfer from Columbia. Audio Transfer Review: Primarily a front channel oriented mix, the 5.1 Dolby Digital track does come alive when the film shifts its attention to the First World War. Aside from these scenes, the mix is relatively tame with most of the audio coming from the front soundstage. The score by James Horner envelops the room on more than one occasion and it creates a nice sound field. Dialogue is clear and mostly easy to understand. Much tamer English, French and Portuguese 2-channel mixes are also offered. Extras Review: While the video and audio transfers remain the same as the previous edition of the film, there are great special features. The first worth mentioning is the commentary track by Director Edward Zwick and actor Brad Pitt. I enjoyed hearing both of their thoughts on the making of this film. While Pitt has more of a laughable side to him, Zwick focuses more on the making of the film and goes into detail with his takes on the story. Pitt is just as relaxed on this track as he was for the Fight Club disc and I look forward to hearing him on other tracks sometime soon. The second track on this disc features cinematographer John Toll and Production Designer Lilly Kilvert, both of whom received Academy Award® nominations for their work. This is a more technical track than the other. While not exactly "film school on a disc", this is a good track and it is worth listening to Toll discuss working on one of the many epic films that dot his resume. Three deleted scenes are offered and you can view them with or without director commentary. Like most deleted scenes, these have good reason to be missing from the final cut, but they are worth a look. Two featurettes are available. The first deals with the production design and the time and effort it took to create the world of this film. It runs a short 4 -1/2 minutes and seems a bit like overkill, considering there is a commentary track featuring the production designer. The second is the film's original promotional featurette and runs a little over five minutes in length. The real highlight of this disc for me is James Horner's isolated music in Dolby Digital 5.0. This is a terrific score although it does grow a bit repetitive, much like some of Horner's other works. It is accessible by its own highlight menu. Both the film's teaser and theatrical trailers are included, as well as trailers for The Devil's Own, A River Runs Through It, Seven Years In Tibet, Bram Stoker's Dracula, and The Mask of Zorro. Production notes and some different but nice talent files round out the disc. 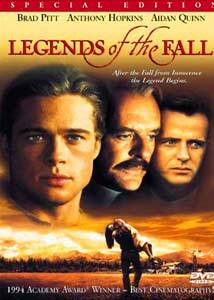 Legends Of The Fall is a good film and as I stated earlier there is something here for everyone. As one of the very first Columbia DVD releases, the original release boasted next to nothing other than the film itself; fans can now breathe easily with this new special edition. Columbia didn't have to do another version of this title, but they chose to, and much appreciation goes to them for their efforts. Recommended.